After probably spending too much time researching shoes, I decided to try the Brooks Ravenna 7 as my next running shoes. I did a lot of reading, but went with these after the Brooks Shoe Finder recommended them. They are a little obnoxiously bright, but it was either these or boring grey. 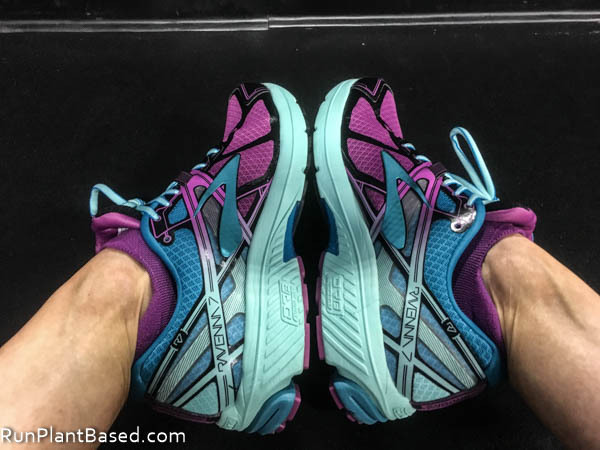 I broke them in with a 3.55 mile treadmill run at the gym and they have a lot more room in the toe box area and seem longer compared to the Glycerin 13s which is good I guess. And a wider stability area in the heel. The run went well, but I’m still adjusting to them and can tell there will be a little break-in period with the internal padding. I’ve been a vegan for over six years now and have never tried making my own seitan, I guess I always thought it was really tough. Well, it’s not! I got brave and decided to try this simple and basic homemade seitan recipe. Wow – vital wheat gluten turns into a strong, gummy dough fast! And I can’t say my first round was a total success in the flavor and texture department, it almost had the texture of raw meat in the center being moist, gummy, and stretchy. But it got my creative juices flowing for how I can modify and improve my technique and bring in more flavor and improved texture. Homemade seitan can be a low cost source of tons of protein since vital wheat gluten has 23 grams of protein per 1/4 cup and pretty much no carbs or fat. Not to be a food waster, I’ve been using my flavor-lacking leftovers chopped up and in place of tofu or tempeh in oil free stir fries like this spicy curry one with potatoes. 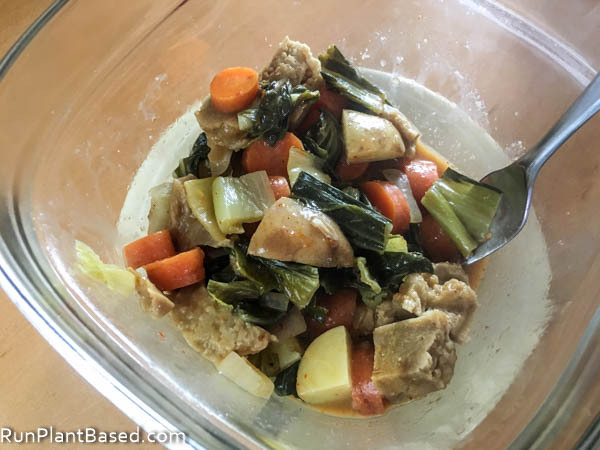 It seemed to absorb the flavors nicely and I can see making large seitan batches at a time to freeze for simple meals. 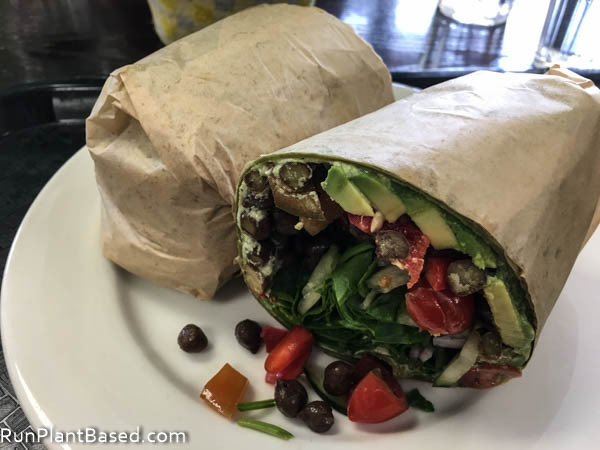 This chana chickpea wrap I got from Baagan on Monday was not lacking in flavor! It’s packed with veggies and a creamy cilantro jalapeno spread that’s addicting! There was also this simple dinner salad one night. 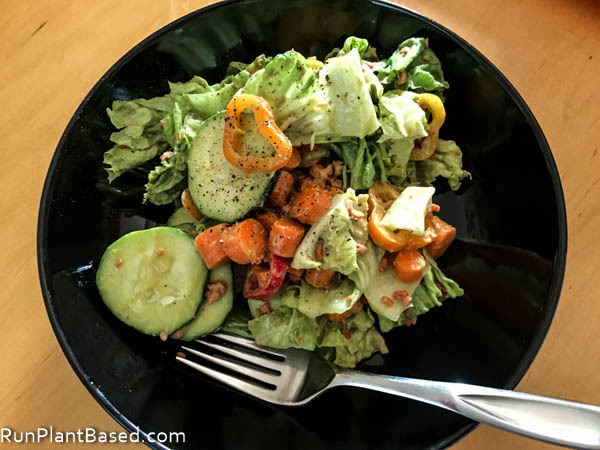 For the dressing I tossed one ripe avocado, raw garlic, lemon juice, apple cider vinegar, tamari, and fennel seed into the Vitamix for a freehand salad dressing that came out good, creamy and bright. 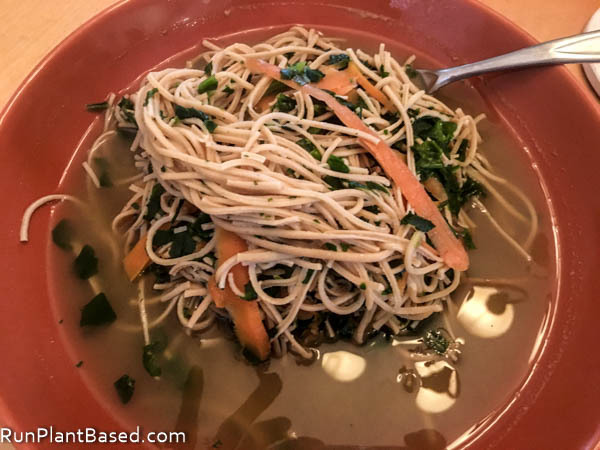 Tonight was all about comfort food after an intense gym workout with a simple miso stew with Explore Asian Soybean Spaghetti, frozen organic spinach, and carrots. Simple, fast since it simmers in a wok in minutes, and loaded with post-workout protein. What’s your favorite running shoe? Well, I’ve never heard of seitan, but I love the idea of more protein. I confess, I’ve been eating one or two avocados with plain salad everyday for lunch. This is the lazy side of me who doesn’t want to cook. Love the new running shoes! I think you were right to go for color over the grey ones. Thanks and seitan is pretty awesome and easy to make, looking forward to adding more flare and improving the texture for my next batch. I NEED to buy new shoes this weekend. I actually need to buy two pairs because you’re supposed to rotate shoes when your training. That’s according to my running coach and other’s I’ve spoken to about marathon training. Right now I’m running in Asics , I’ll have to see what the salesman at my local running store thinks I should try next. So funny, I went to the Chicago Diner for lunch with my kids yesterday and I ordered “chicken” fried steak made from seitan. I told Alex that I needed to try cooking with it. I’m not sure why I’m so intimidated by it. It looks like you did well with it. I’ve had store bought stuff before and tried it at local restaurants, but never made it. You could easily make it and probably way better than my first attempt! The only shoe I can wear comfortably is the Asics Gel Nimbus. I’ve tried other ones but my supination makes it tough to find something else. My husband made seitan a few times last fall. It was okay but not very flavorful. Since he spent half the day each time doing it and it wasn’t exactly perfect he got annoyed and said he’s not making it anymore (he’s a big baby sometimes lol). I wish he’d try again because I love seitan and it’s so much cheaper to make your own. For now, we just buy the pre-made stuff but I’ll try to talk him into making it again soon. 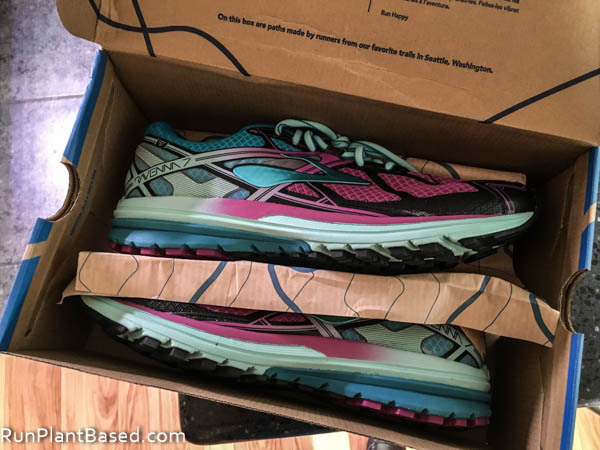 Interesting on shoes, I was an Asics wearer for awhile, but they completely changed my favorite model to the point it didn’t work for me at all and ended up jumping to Nike for awhile and now Brooks. 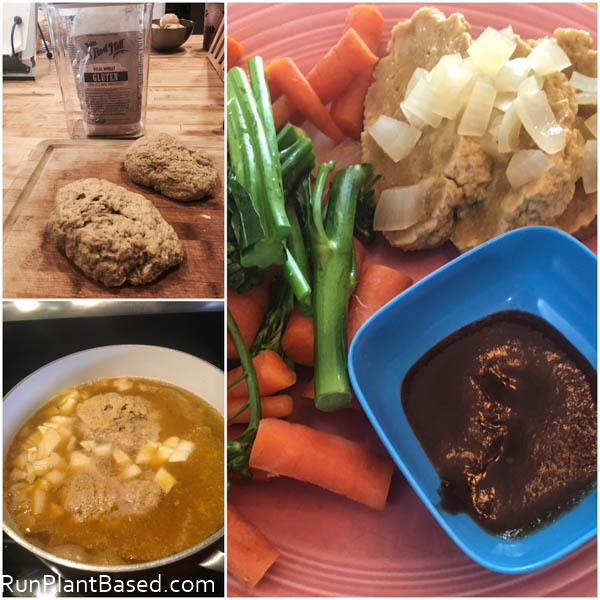 Too funny on seitan, mine was not flavorful either, but I think I can get more creative with blended drying ingredients to add texture – maybe next weekend!